The Colombian government has released estimates indicating that only a small percentage of former FARC guerrillas have abandoned the peace process. But InSight Crime field research indicates that the actual number of dissidents is much higher, and could be growing due to issues related to the implementation of a November 2016 peace agreement with the rebel group. The director of the Colombian agency in charge of reintegrating former guerrillas of the Revolutionary Armed Forces of Colombia, Joshua Mitrotti, recently told Verdad Abierta that just six percent of fighters have refused to join the peace process. “Dissidence, according to the latest reports, is no more than six percent of the original FARC ranks. Which is to say, it is a small minority that is doing a lot of damage to the process,” Mitrotti said. However, according to extensive field work conducted by InSight Crime in several departments across Colombia, the true percentage of former FARC guerrillas who have dissented is likely more than double the government estimates. And their numbers appear to be growing. InSight Crime estimates that there are approximately 1,000 to 1,500 dissidents who have abandoned the peace process for various reasons, accounting for around 15 percent of the total number of FARC ex-combatants. Many of the dissidents identified by InSight Crime have returned to their past strongholds to regain control of highly profitable criminal activities, mainly tied to drug trafficking, though there are a range of reasons why former fighters are abandoning the peace process. 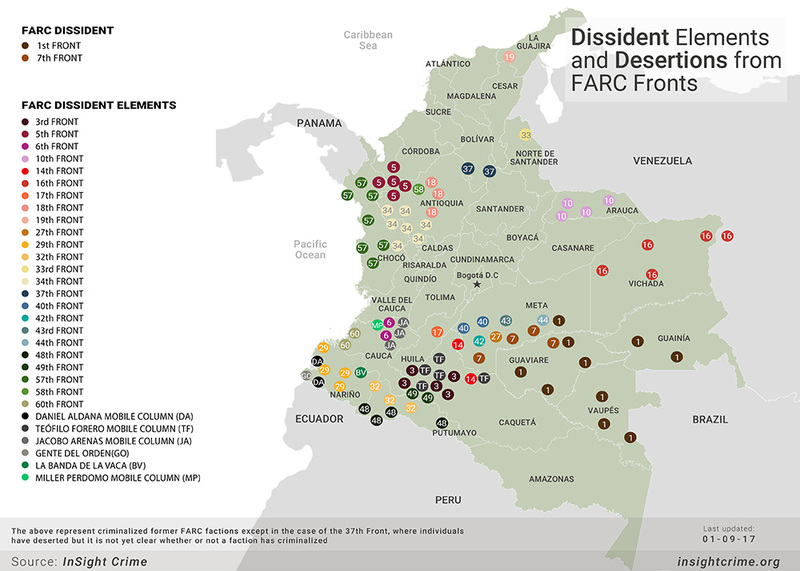 In the southwestern department of Putumayo on the border with Ecuador, InSight Crime has identified about 300 dissidents who formerly belonged to the FARC’s 38th and 42nd Fronts. These dissidents, whose presence has also been confirmed by the Colombian military, are purportedly maintaining a hold over the long-time drug trafficking hub, controlling coca cultivation and cocaine processing. Another 400 dissidents are estimated to be operating in the municipality of Tumaco in the southeastern department of Nariño, which InSight Crime has described as “ground zero” of Colombia’s cocaine trade. Authorities have recently accused the newly formed organized crime groups in Tumaco of supporting protests against coca eradication and playing a role in a bloody incident that left dozens of civilians wounded or killed, though the dissidents have denied it. Several dissident mid-level commanders have also returned to areas once controlled by their fronts in order to reestablish control. This dynamic is perhaps most evident in Colombia’s Eastern Plains region, a longtime stronghold for various armed groups. 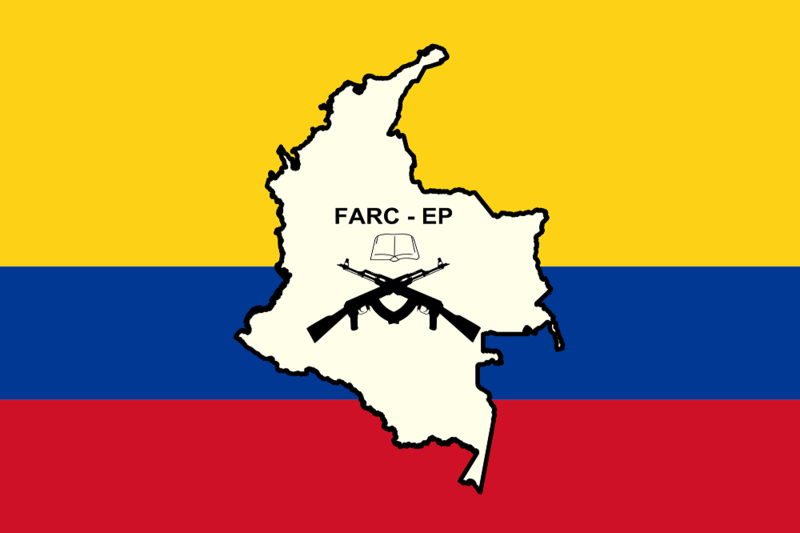 InSight Crime has identified at least 400 FARC dissidents in the Miraflores municipality in the department of Guaviare, one of the areas in the Eastern Plains thought to have a presence of former 1st and 7th Front fighters. Former commanders Miguel Botache Santanilla, alias “Gentil Duarte,” and Géner García Molina, alias “John 40” or “Jhon 40,” as well as a few other commanders expelled from the FARC allegedly maintain leadership over criminal operations in this region. These ex-commanders have also been recently joined by former 27th Front Commander Rodrigo Cadete who is allegedly helping Gentil Duarte expand his criminal organization’s reach into the neighboring department of Meta. There are also some dissidents who are forming alliances with or being recruited by other organized crime groups, particularly in areas where the FARC once held territorial control. For example, in the municipality of Ituango in the northern department of Antioquia, dissidents from the 18th Front, which previously controlled the area, are reportedly operating in conjunction with the powerful Urabeños crime group. Dissidence is a common challenge following peace processes with armed groups, as has been observed in Colombia with the United Self-Defense Forces of Colombia and as far away as Northern Ireland with the Irish Republican Army. However, the Colombian government’s estimates of FARC dissidence fall well below those observed on the ground by InSight Crime, and these numbers will likely increase if issues with the implemenation of last year’s peace deal remain unaddressed. Mitrotti himself recognizes that it would be “naive” to anticipate “100 percent success.” But he and other officials have downplayed concerns about dissidence, saying that many former fighters are leaving to return home to their families or to engage in political activities or work outside of the zones. In fact, the majority of FARC dissidents seem to be largely motivated by increasing frustrations with the government’s noncompliance with key aspects of the peace accord and the appeal of reentering the criminal realm. Former FARC commander-in-chief Rodrigo Londoño Echeverri, alias “Timochenko,” expressed concern last month that the government has so far not followed through with several important aspects of the agreement, including improving conditions in zones where former fighters are supposed to concentrate, as well as providing basic income stipends and advancing agricultural and development projects. Issues like these have led many ex-guerillas to leave concentration zones in recent months, though official figures of this desertion are in flux. InSight Crime research suggests that the Colombian government would have more success stemming the tide of dissidence by focusing on fulfilling peace accord promises such as crop substitution and rural development projects, rather than emphasizing military operations and coca eradication which have in many cases proven ineffective. InSight Crime’s Roadmap to Lasting Peace team contributed to this report and provided the research for the graphics. This article originally appeared at InSight Crime.